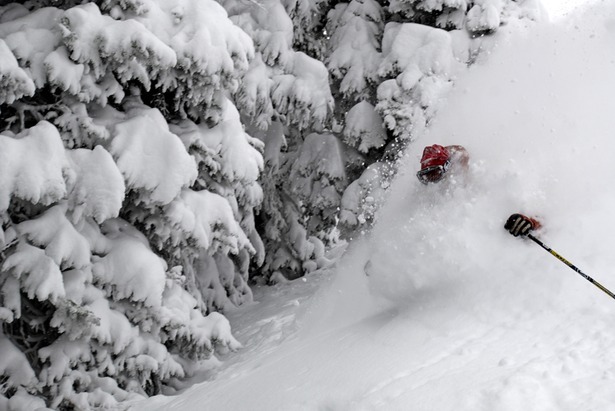 The biggest powder day of my life did not show up on radar. Three feet of dry Steamboat powder was waiting for me as I coasted into town around 7 a.m., but if I had only relied on radar to guide my travels, I would not have made it to this epic day. That’s because according to the closest weather radar, the sky was dry (not so!). While radar is indeed a magical tool that beams the latest weather conditions from the sky to your mobile phone, it shouldn’t be the only tool you use to find your next powder day. Many people confuse radar and satellite, the two pieces of weather technology you often see on TV or online. So let’s set the record straight. Satellite images originate from a satellite that’s 22,500 miles above the earth. Their sensors peer down at the earth and show you the weather from above (just like if you were on a plane really high in the sky and looked down to the ground). This provides a mesmerizing view of the clouds from above, but that’s actually not too helpful for a skier. Why not? Because snow falls from underneath the clouds, so a satellite that’s looking down from above can’t see snow. That’s where radar comes in handy. There are about 150 weather radars positioned around the United States by the National Weather Service. These radars spin around in a circle while emitting a beam of energy. When that energy hits something—like a rain drop or snowflake—it bounces back to the radar station and we magically see a map of what’s falling from the clouds above. To find snow, you should look at radar maps, not satellite maps. In theory, radar is all that you would need to find the deepest and freshest snow. After all, it shows you the exact location of where snow is falling right now. So why is this not a powder chaser’s secret weapon? The radar beam (shown in green) can be blocked by another mountain and may not be able to detect the snow falling over your favorite ski area. The first problem is that radar shows you what’s happening right now, not what will happen in the next 24 to 48 hours. If you’re close to the ski hill and need a quick check of what’s going on out there, radar (and webcams) are a good bet. But if you’re scratching your head trying to figure out where the snow will fall in the next day or two or three, radar is not for you. The second issue is that radar actually can’t detect snow all that well because snow is mostly made up of air, and the radar beam goes right through air without bouncing off. Picture a snowflake and a raindrop for a moment. The raindrop is solid and the radar beam easily bounces off its surface. However a snowflake is not solid at all, and so only some part of the radar beam bounces off of the flake while the rest of the beam goes through the airy parts of the snowflake. Radar can detect snow in most cases, but be careful because the radar may trick you into thinking there’s no snow falling when in fact it’s actually lightly snowing. The third piece of concern when using radar to find snow is potentially the most problematic. We like to ski and ride in big mountains, but these big mountains can block the radar beam and hide the snow. It’s just like when you go to the movies and sit behind someone with a big hat. You’re trying to see the movie, but this person’s head is blocking you. 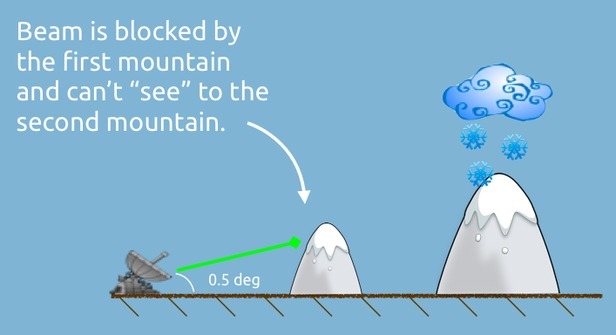 In a similar way, if there’s a big mountain between the radar station and your ski hill, that big mountain might block the radar beam before it even has a chance of “seeing” the snow falling over your mountain. This is not as much of a problem on the east coast of the U.S. where the mountains are smaller, but this is an issue in the higher mountain states of the west like Wyoming and Colorado. And this is exactly what happened to me when I was looking at the radar over Steamboat. The radar beam was blocked by another mountain and showed no snow even though the powder was piling up. So what’s a snow lover to do? Use radar with caution and add some other tools into the mix. Webcams are great because they show you exactly what’s happening on the ground. And social media serves as another complementary tool as Facebook status updates and tweets begin to fly across the internet when the flakes start falling. Radar is one of the cornerstones of modern meteorology, so by all means watch it like a hawk when a storm comes close. But make sure you look at the forecast and other tools as well, otherwise by the time you realize it’s dumping at Steamboat, you’ll be just a bit too late.